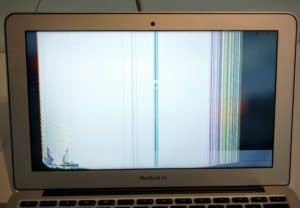 This MacBook Air LCD is pretty badly cracked, the multicolored prism-like lines across the display are completely obscuring the image underneath. The impact was likely to the bottom left corner where cracks are visible. A pencil was accidentally closed between the lid and the keyboard, causing the LCD panel to be broken. In this case, there wasn’t any damage to the backlight, so an LCD replacement is all that this laptop needs to be good as new again.